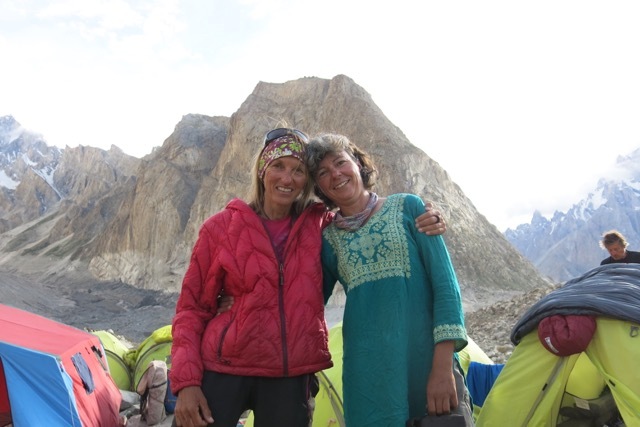 Finally – after having walked across the 63-km-long Baltoro Glacier for four grinding and exhausting days, we arrived back in â€˜Islamagoodâ€™ four days ago, trying to get used the excruciating heat and life in â€˜semiâ€™-civilisation (semi because of the lack of party opportunities). However, it is good to be back in the land of showers, clean clothes and good food, especially after such a long expedition that ended up with us having to rebuild parts of the road from Askole to Skardu as two sections had beenÂ completely washed out by the exceptionally high Braldo River. 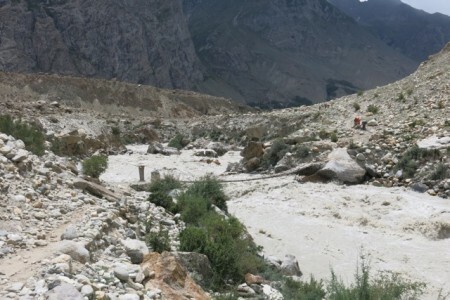 The extreme heat in combination with heavy monsoon rains had raised the levels of this torrential river quite significantly and I can imagine that in a week or two the remaining expeditions on the Baltoro will even have more problems getting through. Camping on the Baltoro Glacier already seems an eternity away even though it was only last week that we were struggling with melting tent platforms, drinking horribly sweet â€˜Tangâ€™ and eating the remains of our food supply, which was reduced to rice, lentils and pasta over the last few days of our expedition. Anyway, as I was not very active in updating my website due to limited Internet opportunities, I guess I owe you a wrap-up of my experience on the Baltoro, which was absolutely wonderful â€“ despite the lack of summit. 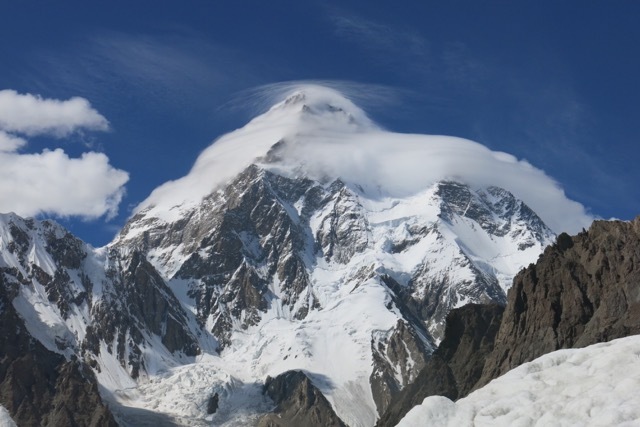 So, what was the problem in the Karakoram this summer? It certainly was not the lack of sunny and calm weather as most days could have been potential summit days with very little cloud and low winds. However, I guess that this was actually a big part of the problem. Snow and ice melted so fast that most of us had to rebuild our diligently constructed tent platforms almost every other day as we could literally feel the ice disappear right underneath our sleeping mats. And all that melting did not only happen at base camp but also further up the mountains. When on 24th July the Swiss team consisting of Mike Horn, Kobi Reichen and Fred Roux together with a Spanish and an Argentinian climber reached Camp 3 on K2, they very quickly decided that the conditions were just too atrocious to go any higher. â€œI think the mountain is unclimbable this season,â€ Mike said when he came to visit our camp to inform us what they had encountered up there. â€œThe fixed ropes are dangling in the air and the traverse below Camp 2 has become extremely technical.â€ As most of our climbers generally rely on the help of the Sherpas as well as fixed ropes this news was rather devastating and the mood in the dining tent dropped significantly. However, despite the bad news Russell was wondering whether the predicted bad weather period could change the conditions up there..but the hope was very slim. 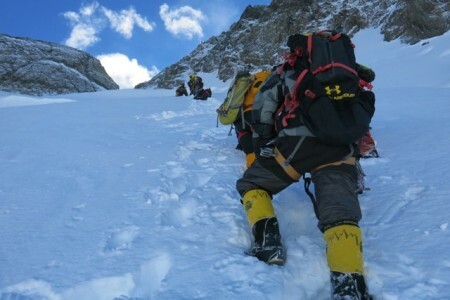 And after Madisson Mountaineering as well as the large Seven Summit team, who had lost a lot of equipment in an avalanche on the bottom of the Abruzzi Ridge, had also decided to abandon their climbs, it was clear that we would do the same. But there was still Broad Peak and even though the conditions were very unlikely to be much different over there, it is by far not as technical and dangerous as K2. 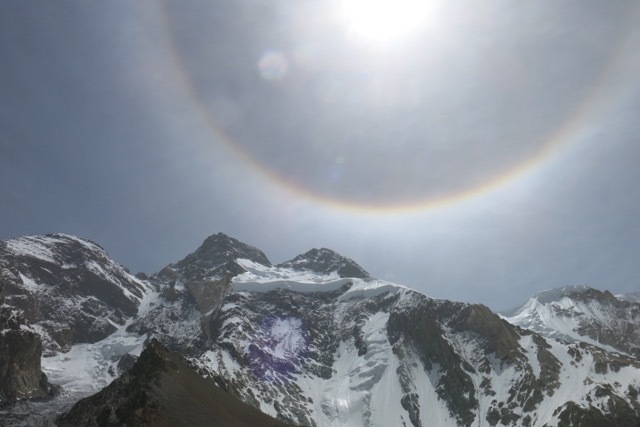 So after several meetings with the Sherpas and the team we decided that those with a Broad Peak permit would go up and try for the summit on 28th July – despite the bad weather forecast. â€œI think we have to go and see as the weather has often not done what the forecast has said,â€ Russell explained. So we set off on 26th July in the hope that the weather would hold, and despite a bunch of dark clouds that greeted us when we reached crampon point at 5am, it turned out to be another beautiful day and we could utterly enjoy the climb up to Camp 2. As most other teams had already abandoned their summit attempt on 24th July, we were the only group on the mountain apart from a lone Brazilian climber, who was still at Camp 1 on her way down from her own summit attempt. The following day was similarly beautiful but the heat we had been experiencing through most of our expedition had been swept away by the wind and for the first time we were not frying in the scorching sunshine. â€œMy fingers actually got so cold that my tips are still numb,â€ Woody said when we reached Camp 3 after having climbed for about six hours. Once again, the climb up was enjoyable and the good thing about climbing Broad Peak is that you get an amazing view of the majestic K2 most of the time. 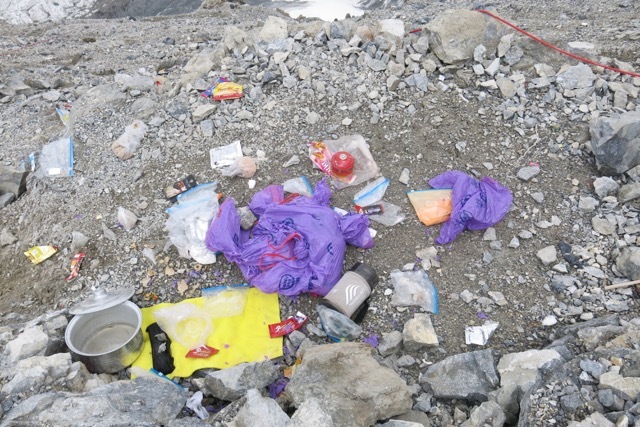 The sad thing was though that we found a lot of rubbish that had been left behind by other expeditions at Camp 1 and Camp 2 and it always boggles my mind that all the stuff can be carried up but for some bizarre reason it often does not find its way back down. It took us less than 30 minutes to get down and be tucked up in our sleeping bags and even though I felt somewhat disappointed, I was also relieved that we did not carry on in the bad weather. I went straight back to sleep, which â€“ about two hours later â€“ was interrupted by Russellâ€™s voice blaring out of the radio: â€œGuys, get up that mountain, itâ€™s beautiful out there.â€ Hmm â€“ nobody really stirred and after about the fifth time of Russell telling us to get our acts together and go, we slowly peeled ourselves out of our sleeping bags and started the slog again. In total we were 16 people with Urken Sherpa and Nawang Sherpa working hard in the front to break trail. The higher we got, the harder it became and after about 150m of vertical height gain we found ourselves in the middle of a loaded slope that seemed very avalanche-prone. The very second I was starting to feel uncomfortable, I heard our guide Woody shout to the front guys that he was not happy with the conditions there either. â€œThe snow has not consolidated and I am worried that if the slope gives in, it could be a huge disaster,â€ he said using his ice axe to check out the conditions of the snow. And he was obviously not happy with what he found: the top layer was crusty with sugary snow underneath and every step seemed a potential danger to trigger an avalanche. After having contemplated the weather, the distance and the avalanche danger we all decided to turn back and I was more than happy to step out of this loaded slope and descend to Camp 3 â€“ even though this meant the end of our chances to reach the summit. 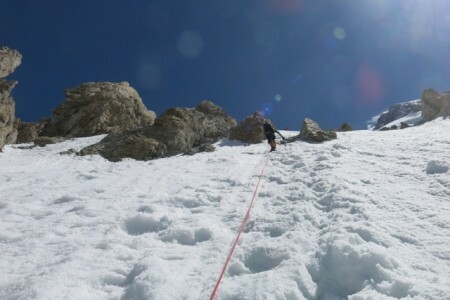 But then again – we gave it a good try and the fact that allÂ other groups – apart from one Argentinian and a Polish climber who are reported to have reached the summit on 17th and 25th July respectively – did not reach the summit either was proof enough that the conditions just were not right this season. Once we reached Camp 3, we quickly packed up our gear and started descending being fully aware of the fact that the rock fall lower down on the mountain would get worse with rising temperatures. The descent was everything but pleasant. Within the short time of two days the conditions had changed again and snow and ice had turned into waterfalls with falling rocks. As most of the other guys were a lot quicker than me, I hung back with Semba from Japan. We were both occasionally collapsing under the weight of ourÂ heavy rucksacks, however, we tried not to remain in the same spot for too long due to the rock artillery shooting from the cliffs around us. Once we reached Camp 1, I was once again appalled by the amount of rubbish that had beenÂ left by the climber we had met when we were going up, however, the lack of space in my heavily-loaded rucksack did not allow me to pick it up and take it down â€“ sorry. When we reached base camp we were all pretty happy to have got back unharmed and even though the summit was beckoning again in perfect weather the following day, we all knew that we would have had little chance to reach it. And so we spent the next two days packing up, collecting rubbish in and around our base camp before we finally set off on our four-day hike towards Askole on 1 August. It was a long walk with a daily average distance of 30 kilometres, but the trek definitely gave me the chance to reflect on the expedition. And even though I had been looking at the mountains in the Karakoram for the past six weeks, I still enjoyed the beautiful surroundings. And we were lucky to have been spared the dreaded rain as weÂ only got soaked for one hour during the whole trek back to Askole. When we reached the tiny settlement on the fourth day, we were informed that parts of the road to Skardu had been washed outÂ and that we should prepare ourselves for a long and arduous journey with some roadworks thrown in. And so it was: about 15 minutes after our departure the following day, we had to stop and rebuild a section of the road, which was so washed out that it seemed absolutely impossible to ever get a jeep across the raging river. 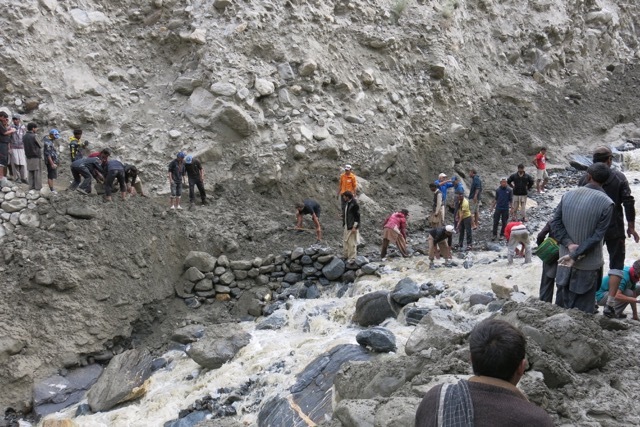 However, after about two hours of many helping hands joining together and digging out rocks and moving mud with our bare hands, the jeeps bumbled over the damaged section and we were hopeful that this would be it and our trip to Skardu would be uninterrupted. But little did we know as after about a two-minute-drive we encountered the next bit of damaged road. So we started all over again and after a total of about four hours we were finally able to start our journey to Skardu, which turned out to be as much of an adventure as climbing the mountain due to the condition of the roadÂ and the extremely high level of the river. I am no back in â€˜Islamagoodâ€™ and it is nice just to be here, relax, see some friends, eat well and catch up on life without having to immediately run around and interview mountaineering expeditions, like I usually have to do when I get back from an expedition in Nepal. It has been good to reflect on the past two months and I have to say that I utterly enjoyed being on the Baltoro, experiencing the way the Baltis run an expedition and being able to absorb the beauty of the mountains there every single day. Not getting to the summit is by no means a failure to me as I consider the summit success an extra bonus whenever I go and attempt to climb one of these majestic giants. And the good thing about not summiting is that the likelihood of me going back and trying again is pretty high. So I am already looking forward to it! Last but not least I would like to thank everyone, who had made this expedition possible. Our expedition leader, Russell Brice; our local outfitter Nazir Sabir; our young Sherpa team, who fixed the ropes and made sure that we were able to climb on these two majestic mountains; and of course ourÂ amazing Balti staff that made our trip so comfortable. And thanks to Pakistan for sharing its beauties with us! So happy that you are safe. Thanks for the wonderful update. It’s awesome to follow your adventures. I almost feel like I’m right there with you. Happy trails Billi. Broad Peak had been partially hidden during our two days stay at Concordia – a day before we met at Gore 2. Try some other year to summit. super Bericht. Ich hoffe wir sehen uns irgendwann irgendwo wieder. Congratulations Billi! What a feat, and a great blog entry and photographs, as well. You all did your best,but the”Windows”was closed and the weather was not kind. As you mentioned before”climbing in Himalaya is a real addiction”,and i am sure you will return and conquer these two majestic mountains. Great update Billi. Shame about the lack of respect shown by that Camp 1 resident. What an utter disgrace. vielen dank fÃ¼r den wundervollen bericht !! !ganz schade dass es fÃ¼r euch nicht geklappt hat, aber die berge sind auf ihre art – zum glÃ¼ck – immer noch viel stÃ¤rker als wir …….. I very much enjoyed reading your account. Thank you for sharing. It was a shame that the conditions were against you this time. Sorry it didn’t work out this time Billi. Better to be safe than sorry. Thanks for the great account of your attempt. take care. Wonderful account. And i admire your spirit and positivity.You shall climb all the eight thousanders in my country very soon. Thank you for reminding me of my amazing experience on the Baltoro a few years back.